My Dad has an obsession with ginger and mint flavoured sweet treats!! I do share in his love of mint dark chocolate and fell deeply in love with dark chocolate coated stem ginger when in New Zealand and Australia. I wouldn’t normally have chocolate first thing in the morning but I would have oats. This was the inspiration for creating a ginger flavoured granola. Granola was the very first recipe on my blog nearly four years ago and it is still a regular creation in my kitchen. For my recent private catering event, I tested out my first batch of Ginger & Coconut Granola with people other than myself and it got a very positive response. Ginger is honestly one of the most versatile natural seasonings you can have in your kitchen. I freeze it from fresh and then grate it into curries, soups, salads, baking and now breakfast cereals. No need to peel the ginger either as the skin is packed full of flavour and goodness too. You honestly can’t go wrong with a little fresh ginger! 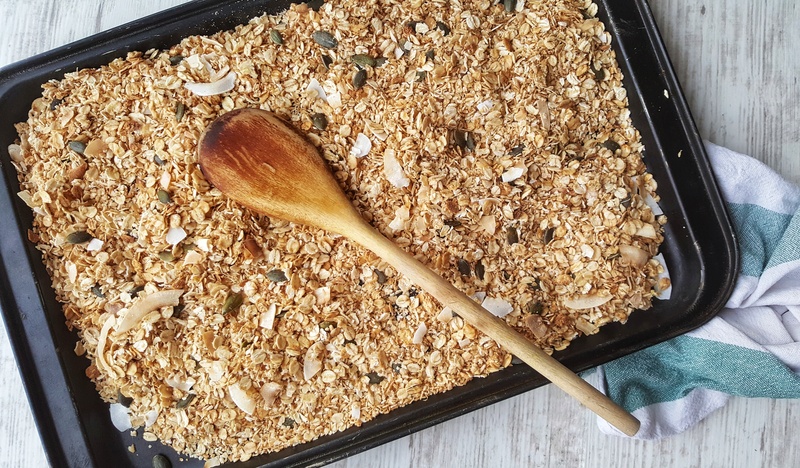 Mix the oats, seeds and desiccated coconut together in a large mixing bowl. Grate in the ginger and mix again. Rub the solid coconut oil through the oat mix with your fingertips until well combined. Evenly spread on a baking tray and place in the oven for 15-20 minutes or until golden. Remember to turn the oats regularly to ensure an even golden colour. Remove from the oven and allow to cool before storing in a resealable container.